Just before the Vegas Golden Knights took down the San Jose Sharks to take a three-games-to-two lead in the second round of the NHL Stanley Cup Playoffs, Day 4 of the Season XVI WPT Bellagio Elite Poker Championship Main Event came to a close. 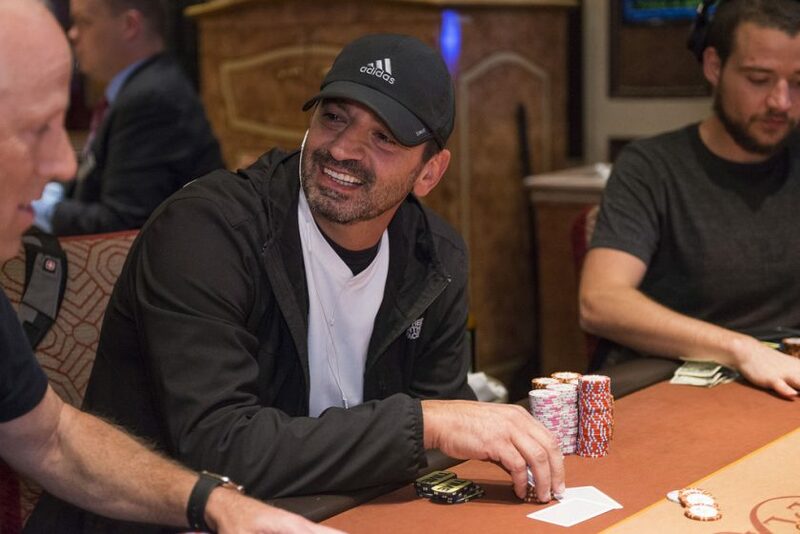 The day ended when Cary Katz bowed out in sixth place and the remaining five players decided to bag and tag their chips in order to jet over to the hockey game at T-Mobile Arena a mile down the road. Leading the final five was Danny Qutami (pictured) with a stack of 1.077 million and he’ll be looking for his first World Poker Tour title. In the view of many, Qutami has already won. It’s his second-ever WPT Main Tour cash and the $78,221 he’s guaranteed is by far the largest live score of his tournament career. According to HendonMob.com, Qutami entered the WPT Bellagio Elite Poker Championship with just shy of $250,000 in live tournament earnings. His last and only WPT cash was back in Season X in 2012 when he placed 31st in the WPT Bay 101 Shooting Star Championship. Helping Qutami to bag the lead were three back-to-back-to-back eliminations he scored. Fourteen players from the 126-entry field returned to Day 4. After Julian Parmann busted in 14th and Mike Vanier went out in 13th, Qutami busted Daniel Merrilees in 12th, Justin Young in 11th, and Allen Pock in 10th. With Young’s elimination, Ryan Van Sanford was left as the only WPT Champions Club member in the field. Sean Winter was next out the door in ninth, then Kevin MacPhee, who began the day as the leader, busted in eighth place following a wild turn of events. With eight players left and the blinds at 3,000-6,000 with a 1,000 ante, MacPhee raised to 15,000 from under the gun. Larry Greenberg reraised to 50,000 from middle position, and MacPhee called to see the flop come down . Both players checked before the dealer added the to the board on the turn. MacPhee checked, Greenberg raised all in for 441,000, and MacPhee called with the for a set of sixes. Greenberg had turned a better set with the and held with the hitting the river. It was the biggest pot of the tournament until that point and pushed Greenberg to just about 1 million in chips. MacPhee was left with 175,000 and eliminated a little under an hour later when he ran pocket nines into the pocket kings of Qutami. For MacPhee, a chance at live poker’s Triple Crown achievement had been lost. Ben Palmer then busted in seventh place before the final six players requested to play through for another hour instead of stopping. The request was granted and play continued on. During the hour of play, a short-stacked Katz was eliminated by Adrian Garduno and that was the end of play for the day. Heading into Saturday’s Day 5, Greenberg is second in chips with 914,000, then it’s Garduno with 794,000, Van Sanford with 706,000, and Jim Collopy with 285,000. Van Sanford is the only WPT Champions Club member left in the field and looking for his second World Poker Tour title. His first came in Season XIII when he won the WPT bestbet Bounty Scramble for $421,668. In addition to the $10,400 buy-in WPT Bellagio Elite Poker Championship Main Event, the festival schedule features a $25,000 buy-in WPT Bellagio High Roller that kicks off Saturday, May 5. The first two days of this event will run May 5-6 and the field will play down to the final table of six. After the final table is reached on May 6, the players will break to return on May 25 to play out the final table at the brand new, state-of-the-art Esports Arena Las Vegas at Luxor Hotel & Casino. This event will be filmed for television broadcast and the winner will receive a luxurious Hublot watch. For more on this event, click here. Play in the WPT Bellagio Elite Poker Championship Main Event will resume at 12 p.m. PT on Saturday from Bellagio in Las Vegas. Up top is a $378,879 first-place prize that includes a seat in the season-ending WPT Tournament of Champions. Who will be winning that money and the title? Stay tuned to WPT.com to find out!